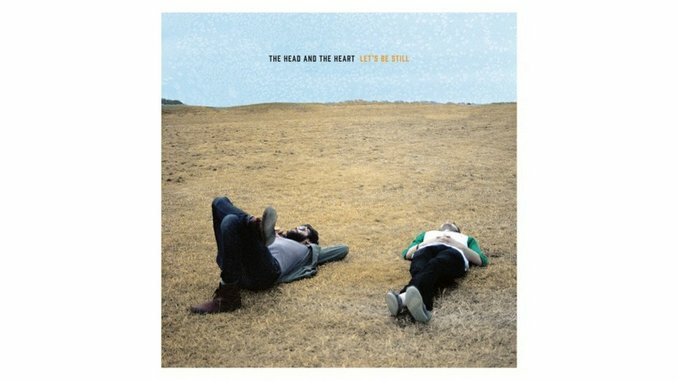 There are a lot of reasons why The Head and the Heart’s sophomore album, Let’s Be Still, lives up to its name. The jaunty pace with which the band’s self-titled debut sauntered all but required a bit of a reining-in, even if songs like “Ghosts” bled so much jovial zip they were hard not to toe-tap along with. On Let’s Be Still, the warm vocal tandem of Josiah Johnson and Jonathan Russell is pared down to its core vibrancy, as two soul-sapped, lovelorn bellowers more casually croon their wishes and woes. “Homecoming Heroes,” the album’s opening track, immediately ushers in a more thoughtful, pensive sort of songwriting, plodding as it does with whip-smart melodic interplay through a lusher instrumentation of violin, piano, quaint guitars and banjo. Russell’s sharply emotive vocals, in particular, edge toward the epic nearly right away, prompting a clear expectation that some gallant journey is afoot. Let’s Be Still’s first single, “Shake,” chugs like a fussy train up a set of smooth northwest rails, Russell singing “The memories we’ve made will never be lost/The look on your face, we both knew the cost/But the wind, yes the wind keeps howling.” The wide-open aesthetic of the band’s folk-lite spread provides the perfect bedfellow for songs both timeless-sounding and simultaneously innocuous. That last observation, though, is probably unfair considering the deluge of bands who’ve in the last five years sifted the dirt from a common sandbox. What The Head and the Heart excel at, in spite of so many indie-folk contemporaries, is a fine grasp of ballads that don’t come across as hokey, just heartfelt. “Cruel” takes aim at despair through a focused scope, as a hopelessly gorgeous chorus chants, “Like the wind in the trees, a cool summer breeze/Like the curls in your hair everyone stares at/the hole in the wall is all in your head/there’s a memory there all through the night.” Songwriting of this caliber has generally been relegated to the uber-prolific, hit-or-miss oeuvre of artists like Ryan Adams, and the songwriting of Russell and Johnson isn’t too far off. It’s essentially their awareness of the pop element of what they’re putting out that makes these songs so great to listen to. They seem built to withstand pretty much any shift in the whims of the fickle pop culture landscape, and that’s almost certainly not an accident. The best evidence, perhaps, of that awareness is on the album’s title track, which begins with the prophetic line “You can get lost in the music…/We can play music for hours and hours but the sun will still be coming up soon.” Later Russell opines, “If things don’t slow down soon, we might not last,” driving the thrust of the album’s theme right down the listener’s earholes. Take a moment, listen, be still.